Children aren't just tiny adults. Their growing bodies and developing minds require specialized care. That's why we offer state-of-the-art radiology services for children from birth to age 21 that accurately diagnose medical problems. CT Scan: A pediatric CT scan uses advanced X-ray technology to take cross-sections of your child's body, called slices. The CT scanner is a doughnut-shaped machine used to view parts of the child's body that cannot be seen with a regular X-ray. DEXA scan: A dual-energy X-ray absorptiometry (DEXA) scan is a special pediatric bone scan that uses X-rays to determine the strength of bones. It is the most accurate method of testing bone density using the lowest amount of radiation. Fluoroscopy procedures: These procedures use an X-ray that allows radiologists to view internal organs in motion. The video images are transmitted a video monitor. MRI: An MRI produces very clear images of the human body using a large magnet, radio waves and computers to take pictures of the body. Nuclear medicine: Nuclear medicine imaging for children uses very small amounts of radioactive materials to diagnose and treat disease by providing information about the structure and function of body parts. In imaging, the radiopharmaceuticals are detected by special types of cameras that work with computers to provide precise pictures of the area of the body being imaged. PET/CT: Positron emission tomography (PET/CT) imaging offers physicians a unique view of the body's organs and tissue because it records function by showing pictures at the cellular level. Sedation and anesthesia services: When your child has a procedure or surgery, he needs to stay still, from a few minutes to a few hours. To help with this, our team offers sedation to relax your child or anesthesia to put your child to sleep. Ultrasound: Ultrasound uses sound waves to study hard-to-reach areas of the body. Ultrasound is noninvasive and uses a small probe that is run over the area of the body being studied. This ultrasound translates the sound waves to create a digital image. X-ray: X-rays are made by using low levels of external radiation to produce images of the body, the organs and other internal structures for diagnostic purposes. An X-ray provides a picture of inside the body by using special radioactive rays. An X-ray can show bones, tissues or parts of organs. Additional radiology services include intra-operative magnetic resonance imaging (iMRI) and functional magnetic resonance imaging (fMRI). Children’s was the first pediatric hospital in the U.S. to use special shields that reduce radiation exposure to sensitive body parts. These shields, known as bismuth shields, are made for adults, but our radiology team makes special alterations to each shield to so they fit our young patients perfectly. Children’s follows As Low as Reasonably Achievable (ALARA) and Image Gently guidelines to ensure the radiation levels are as low as possible. Doses are based on the specific area of the body being scanned, the number of recent scans and the patient’s weight. Children’s customizes each patient’s scan, allowing us to reduce the amount of CT and X-ray radiation your child is exposed to by up to 50 percent compared to adult facilities. We treat patients of all sizes—from tall teens to small infants—so we know it's important to have equipment that is the right size for each patient. Children’s has a wide variety of IV sizes to accommodate each patient's needs. Smaller IVs can help our patients feel more comfortable and have a better experience. When children are nervous, upset or restless, or just very young, they may move too much to get a clear enough picture for doctors to diagnose them properly. As a result, scans have to be repeated. Our team includes pediatric-trained sedation specialists who are available to provide medication to help patients stay still or relax for their procedure. Our sedation specialists have years of experience at giving the right dose of medication to keep your child comfortable and safe. Even patients who do not require sedation may still be anxious about their radiology experience. Some of our centers offer child life specialists who use distraction techniques to help settle nerves. Our rooms are calming. For example, we have illustrations of space and fantasy lands that can be projected onto the ceiling to distract patients during procedures. Our staff has pediatric training and knows how to relieve anxiety for both our patients and their parents. Although our therapy dogs don’t typically hang out in the radiology rooms at our hospitals, they are happy to visit to help a child through a procedure. Patients can request to ride the CT machine with a child-sized stuffed animal or one of our therapy dogs to comfort them. 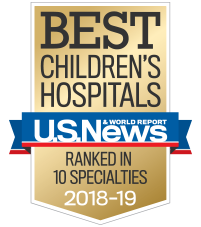 We are proud to be a leader in pediatric radiology. Our Radiology department has been named one of the only pediatric Diagnostic Imaging Center of Excellence (DICOE) programs in the country. We are one of the only facilities in Georgia to receive this designation. The Children's radiology departments are accredited by the American College of Radiology (ACR). Accreditation by the ACR demonstrates a commitment to quality care and patient safety.